Contacts and addresses are an important part of every invoice - they determine the recipient of the invoice and the way of distribution. JustOn provides several contact and address fields, which serve different purposes. This document outlines how these fields interact, how to apply them to support your invoicing and dunning processes, and how to use contact roles to automate the selection of contacts and addresses. There are several types of addresses available on the Invoice object. 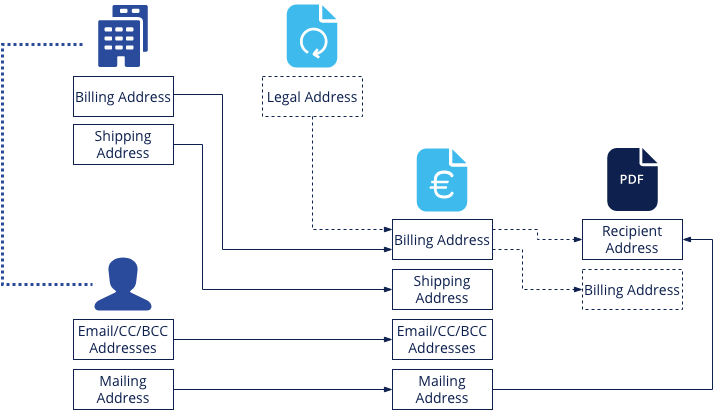 The main address that determines the legal recipient of the invoice is the billing address, which is copied from the account's billing address. In a recurring invoice scenario, JustOn can override the billing address from the associated subscription using the legal address fields. Your business may require to distinguish between the billing address and the shipping address. This is why the invoice includes shipping address fields as well. They are, however, not used for sending invoices; they rather provide a means to store the shipping destination for information purposes. JustOn supports several ways to actually distribute invoice or statement documents - you can send them by email or store them to specific locations from where you can print them for postal delivery. The email address fields are used to store email addresses of the recipients. You can either just enter an email address or exercise a more fine-grained control using the CC and BCC email addresses. In order to determine the postal mail recipient of an invoice, JustOn provides the mailing address fields. Note that if the billing address differs from the mailing address, the two addresses are printed to the invoice PDF in order to specify both the legal recipient and the recipient for the postal distribution (see PDF Contents). As mentioned in General Address Concepts, the billing address is taken from the account. This address represents the main address that determines the legal recipient of the invoice. A legal address as specified on a subscription overrides the billing address. All other address fields are copied from the associated contacts upon invoice or statement creation. This allows to store address data in a central location: the Contact object. Contact: The primary contact to which the invoice will be sent. Mailing Contact: The contact that provides the mailing address for postal distribution. Email Contact: The contact that provides the primary email address. Additional email addresses that will receive the invoice can be specified in the Email CC and Email BCC fields. If specified, Mailing Contact and Email Contact override Contact. If not specified, Mailing Contact and Email Contact fall back to Contact. For additional information about contact roles, see Contact Roles in the Salesforce Help and Contact Role Mappings. The Invoice Mailing Contact and Invoice Email Contact use the Invoice Contact as a fallback, so you do not need to provide the three of them in order to correctly populate the mailing and email addresses, unless you want to use different contacts. If you want to use different recipient information for dunning reminders, you can use the dunning contact roles. Thanks to the implemented fallbacks to the corresponding invoice contact roles, you do not need to take any action if the recipients of invoices and dunning reminders are the same. Be aware that you can still override the address data fields as retrieved from contacts or contact roles. From subscriptions: Subscriptions have contact and email fields that are named exactly as the invoice fields. When an invoice is created from a subscription (either manually or during an invoice run), the subscription fields take precedence and override all other rules. This allows, for example, to store dedicated billing information on an individual subscription only, leaving the account data untouched. From opportunities: Opportunities may have defined contact roles. With opportunity billing, JustOn uses the opportunity contact role (if available) rather than the account contact role. Manually: You can override all fields of Draft invoices manually. This is useful if you must modify a single invoice only and do not expect to apply these changes in the future. Note that changes to address fields are not written back to the original account and contacts. The invoice stores a copy of the corresponding values in order to be able to retrieve the invoice data later, even if the original objects have changed. To get a better understanding of the result of all contact role mappings and overrides from the subscription, JustOn provides a specific section on the subscription detail page: the Contact Role Preview. It shows a preview of the contacts that are used when a new invoice is created. If you are not satisfied with the result, you can either edit the contact roles of the associated account, or you can specify the contacts on the subscription. The Contact Role Preview will immediately show these modifications. Mailing Contact and Email Contact both override and fall back to Contact. If defined, the Mailing address data override the Billing address data for setting the address for postal distribution.